Elizabeth is a young Chinese girl who has been adopted by an American family. Elizabeth begins to question her adoption and wonders why her mommy in China did not keep her. Elizabeth's mother explains the adoption to her and loves that she has a mother who is far away and one who is close. 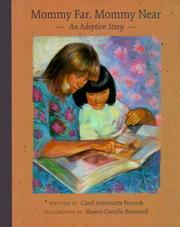 Peacock, Carol Antoinette, “Mommy far, mommy near: An adoption story,” Children's Picture Book Database at Miami University, accessed April 23, 2019, https://dlp.lib.miamioh.edu/picturebook/items/show/5944.